We where 11 people on the tour. We drove 10min to a hotel at the river where we had a lovely meal outside at the river watching the sunset. Drinks are very expansive so we just had our water which came with the meal. Plenty of time we watche the Xmas display in and outside the hotel. Than it was time to Buggi night markets. If you don't like little streets, than next door is a big major Shopping center. Very nice to escape the hot humidity. 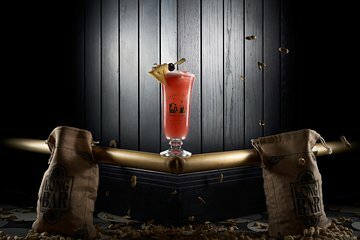 After that off to Raffels for a Singapore Sling. We had our tickets booked without but decided to go after all with everybody. My husband does not drink it was possible to see that wonderful place and only purchase 1 cocktail. The most expansive one I ever had. But the surroundings reminded you on an old movie set. 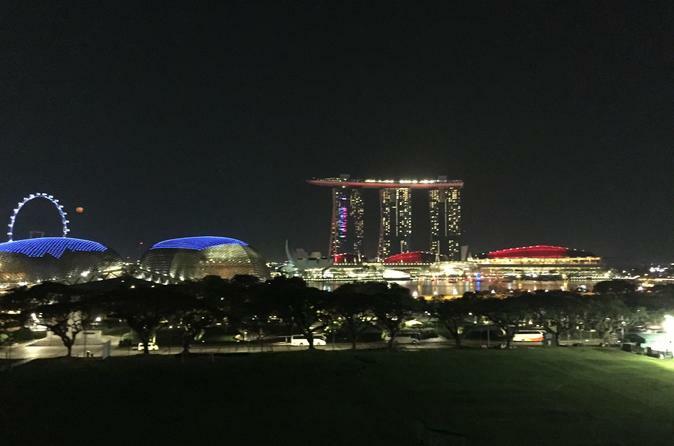 My husband was not too well for long walking due to a reasant operation so this trip gave us still time to enjoy Singapore by night and a authentic dinner and a bit markets for 30min.The tour gide gave us incredible comentrie about the how people live in Singapore. For this price it was worth every penny. Dinner was just a simple meal. Tour guide was good and provided an interesting historical narration of the city while we drove through. Then took us to a place to get a view of the city at night which was appreciated as it rained the night before and was not able to get good pictures. Thanks for doing that. The Dinner was not worth the money. There were too many people trying to get round a buffet counter so by the time you sat down to eat the food was cold.Also there was a lot of waiting around to actually board the coach initially.At the end of the trip we were waiting around again to be returned to our hotel as bus wasnt ready and waiting. We stopped at the Bugis Night Market not worth going as 25mins stop not really enough time to do anything worthwhile.Only saving grace fir this tour was the cocktail bar where we were able to get a great panoramic view of Marina Bay at night. Awful from start to finish. If I could give no stars I would. Guide Joseph and I use this term loosely, was rude and was more interested in his mobile phone than his job. Food and restaurant wasn’t nice, cocktail finale was embarrassing as there was a private function so we we shoved in a corner. Dinner could have been at a better restaurant. It was not the cleanest and the dinner was not the best. Drinks were great at the rooftop terrace. Welll organised tour, downside was the food included in the dinner was very poor. Really poor tour, very disappointed. Our guide was not very knowledgeable and did not give much information about the city. We found out more by ourselves just walking a round the city. The Chinese meal was the worst Chinese I had ever tasted and my wife was ill Following eating hers. This restaurant should not be used for tourists, it is a disgrace. Tour was late collecting us and dropped us off 200 metres from our hotel at the end. This Singapore sling was very nice, but we were led to believe that only tours could access the smoke and mirrors bar, when in fact anyone could walk in there. This tour was not worth the money! Not a good start to our holiday, will not use Viator again anywhere in the world!